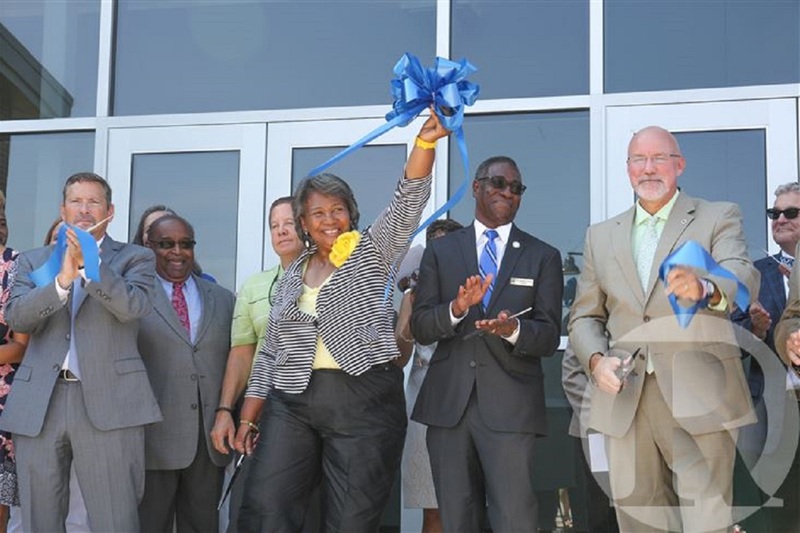 Nearly 300 people gathered at Pitt Community College (PCC) on August 10, 2018 to celebrate the opening of the new Pitt County Schools Early College High School, designed by Greenville-based JKF ARCHITECTURE. Originally opened in 2015 and located in temporary trailers on the PCC main campus in Winterville, the Early College High School is the product of a partnership between Pitt County Schools and PCC. Instruction centers on science, technology, engineering, and math. Enrollment is competitive. Students who participate in PCC clubs, organizations, and student activities throughout the academic year can graduate in four to five years with both a high school diploma and an associate degree from the community college. Funding for a more permanent space for the Early College High School became available after JKF ARCHITECTURE’S recent efforts on PCC’s new Science and Technology Building bid over $3 million under budget in 2015. At a cost of approximately $3.4 million, the new 13,000 SF Early College High School is home to 275 students and 16 faculty and staff members. It features eight classrooms and a multipurpose room.